I'm not sure if you all know this but I've decided to stop writting on my sewing blog "Lets Do Sew" and concentrate more on "Petit a Petit and Family". Designing, creating and sewing childrens clothing, specially for my kids, is a passion of mine which I'd like to keep doing and share with you. So what I'm trying to say is would you like to see some sewing on this blog on a more regular basis? Eventually, I'd like to write up some tutorials and maybe one day share a pattern for you to make. I'd love to hear your thoughts- no worries I won't be sewing everyday, maybe once every week or every other week. I have a few things planned out already, a few pattern reviews and I'm taking part of 2 really fun series. 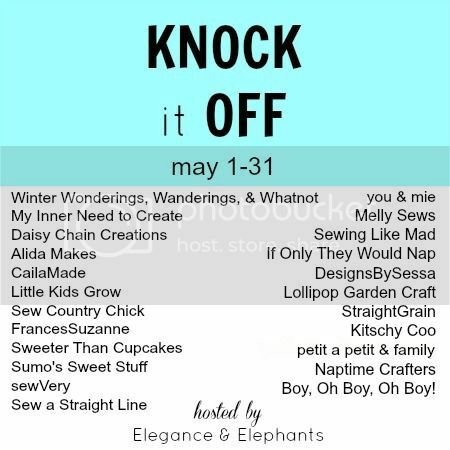 The first is the Knock Off Series over at Elegance & Elephants on May 29th. I'm not sure what I'll be making just yet, I'm always changing my mind and I feel like it will be hard to top the last time I participated- remember the Bear Hoodies? The series starts today, so you should check it out... and sew along if you like! The second series, is Belgium Style hosted by An form Straight Grain. I LOVE childrens clothing from Belgium. I'll be creating an outfit inspired by Belgium Style, not before June 17th! And you are thinking what is Belgium Style- no worries I'll have a post up for you soon with all my favorite looks and brands. Check out what everyones been creating- it is really impressive and you can sew along too! So! What do you think- do you like the idea of a little more sewing from me on the blog?